It should be the other way around, right? The mother is active, involved and encourages her daughter to DO stuff--to be outgoing, committed to a cause or a passion, to help others. With me and my daughter--the one with RSD/CRPS who's in a wheelchair for a year and a half, it's the other way around. My daughter influences me. You see, I'm lazy by nature. My favorite activity is doing nothing. What I mean by that is, my favorite activities are more sedentary; like reading, or singing, or playing Words with Friends and Scrabble, or watching a movie. For example, I love a well-kept and cultivated garden. I love the colors of the flowers, the order they are in, the straight edges of the flower beds (or curved-they just have to be clean-cut, and neat), the rich grass around them, deep green, evenly mowed and beautiful. I love plants: the various varieties in their little pots, or in the ground, well taken care of, watered regularly, and fed, like a pet, with plant food. I love these above-mentioned things, but do I do anything about it? Nope. Not usually. I just don't have the get-up-and-go to... get-up-and-go. My arthritis is one reason: my mid-foot area on both feet are swollen and painful because of arthritis and bone spurs. My arthritic knees complain every time I walk, and they'd really chew me out if I dare to bend them. And one needs to bend one's knees to cultivate a garden. But winter is over (I think; you never know in my neck of the woods. I mean, we did have snow on May 1st....! ), and I've been looking at our little patio-and-grass area in back of our townhome, envisioning beautiful colorful flowers, and neatly cut green, green grass. My D.H. meanwhile, was envisioning an herb garden (remember, he's the chef in the family; the kitchen is his domain). What to do, for lazy sticks-in-the-mud like me? This does not apply, by the way, to my D.H. He didn't wait for me: he went out on his own, bought 8 different kinds of herbs, planter boxes shaped like window boxes, long, rectangular ones--and Miracle Gro soil, and together we planted the herbs in the boxes. He made me do it. Actually, he wanted to share it with me. So I grudgingly agreed. 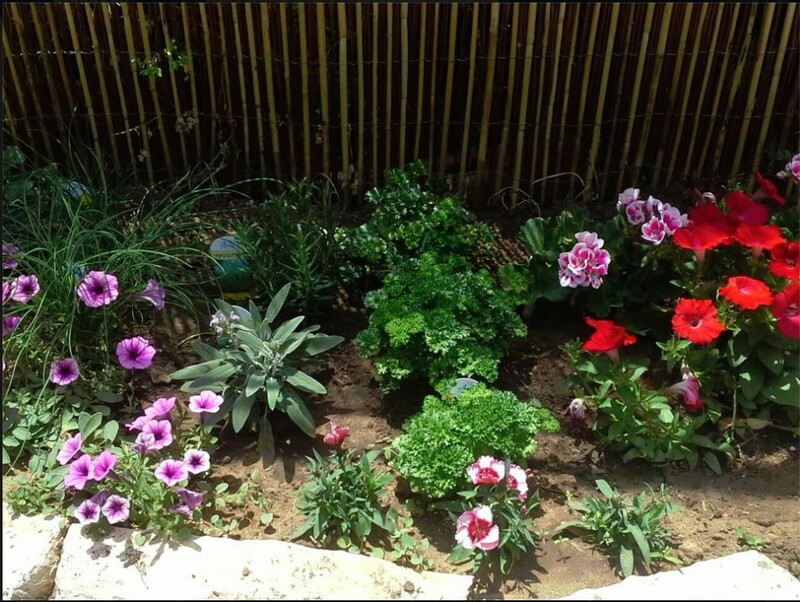 But I've been speaking to my daughter in Tel-Aviv, who single-handedly created a beautiful garden of her own in her back yard (it's actually her front yard, which you walk through from the gate street-side to her front door. Which in the original apartment was the back door. Don't ask. It's Israel.). 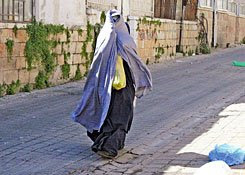 She bought fertilized soil, like Miracle-Gro, but the Israeli version ('Gidul Nes'? 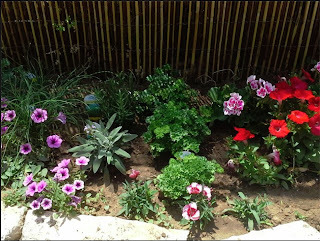 ), mixed it into the ground in the areas in which she wanted to plant, moved rocks around to create a border, and planted her herbs and flowers. By herself. From her wheelchair. So that really makes me 'chopped liver' (I'm from New York)! And then, my daughter told me she's making a chocolate cake for Shabbat, for her, her brother and his daughters, who were there at her apartment for the afternoon. Now, I really felt guilty! I hadn't baked, except for challah, in so long I couldn't remember the last time. So she gave me incentive to do that, too--I baked an almond poppy seed bundt cake for the first time (I can't remember ever baking a poppy seed cake; I love poppy seeds!). If you don't look too closely you won't see the part that stuck to the pan and came off the cake. And I sprayed the pan, too. I think it's because I did not modify the recipe for high altitude, but it tastes delicious (what do you think I did with those parts?). Thank you daughter, for giving me incentive to do and grow!